Today I received a notice from Charter that they've made my internet connection even faster, at no charge. 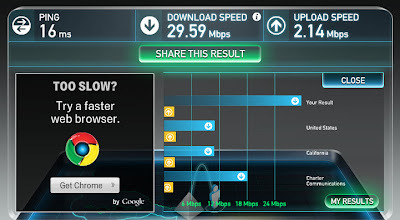 Being the skeptical person I am, I tested it via speedtest.net and lo and behold, they were right. I was already getting very fast download speeds but now it is even better. Click on the image for a larger version. I think that is about 30x faster than the connection at work.. pretty sad, isn't it?